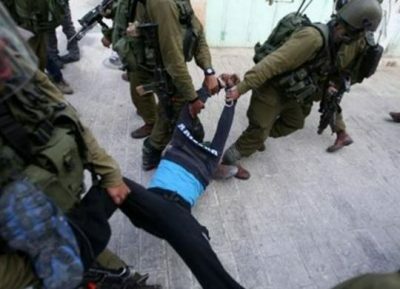 The Palestinian Prisoners Society (PPS) has reported that three Palestinians, who were recently kidnapped by the army, were repeatedly assaulted by the soldiers, and by the interrogators at an army base in Entael illegal colony and Etzion military base, in the Hebron district, in the southern part of the occupied West Bank. Jackeline Fararja, a lawyer with the PPS, managed to visit the two detainees, identified as Ibrahim al-Masalma, 29, and Ala’ Yousef Sweity, 23, from Beit ‘Awwa town, southwest of Hebron. Fararja added that the two young men were repeatedly assaulted by the soldiers, who invaded their families’ homes, and also by the interrogees, causing various cuts and bruises to several parts of their bodies. She also said that the soldiers, and interrogators, attacked Ibrahim Mohammad Ibrahim Eghneimat, 24, from Beit Surif town, northwest of Hebron, while interrogating him in Etzion military base and security center. On Thursday morning, a number of Israeli military vehicles invaded Beit Ummar town, north of the southern West Bank city of Hebron, searched several homes and kidnapped one Palestinian. Also on Thursday morning, the soldiers invaded the West Bank city of Bethlehem, and nearby Beit Fajjar town, broke into and searched a few homes and kidnapped two Palestinians. On Thursday at dawn, undercover Israeli soldiers also infiltrated into the northern West Bank district of Jenin, and kidnapped two Palestinians. On Wednesday at night, the army kidnapped four Palestinian children after invading their families’ homes and searching them, in Silwan and the ar-Ram towns, in occupied Jerusalem.